Comments on "The Gentlelady & Gentleman Biker, Paris & Milan"
Great color palette, nice pose, distinguished features and great shoes. A natural model if you ask me. I wish they were more popular here in Madrid. Love the man with his bike. He looks great and I'd love to see him tooling around town. Very dapper biking attire. That's what I love about Italy, there are so many people that exactly know what fashion is. Particularly tailored fashion is something that you won't easily find perfectly executed in any other countries then Italy and France. I absolutely love these. The poncho is great and there is just something about vintage bikes that make things that mush cooler! Thanks you for these, Sart! oh yes. I love this! Bike chic is the way to be. The woman really knows what colors work for her. Love the little bit of lumberjack plaid peeking out! I love her handbag in the first shot! And her jeans. And basically the whole outfit. Love seeing well-dressed people and on bicycle. I used to see a lot of pashminas and suits on the bike in Amsterdam and Antwerps. Nice mix of smart and casual. Btw - the word verification is 'jacking';)) - good one. I like the balance in the woman's ensemble: warm vs. cool, the warm tones of her boots, pancho, scarf, and shirt as opposed to the stony cool of her pants and bag. Also important is the trade-off between the volume of the top and the skinny jeans. But I don't think she spent a lot of time thinking it all out; she seems so natural. I love how the bikes match each of their styles. Great biking attire. Nice shot. You know what? I think I'm gonna make some good-looking-people-on-bikes pictures here in the bike-capitalcity of the world: Amsterdam. Thanks for the inspiration, Scott. 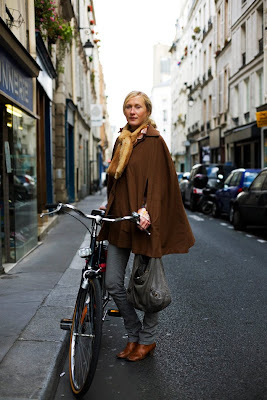 The cape is a perfect bicycling garment. Bicycles are definitely a way forward for inner city transport. Handsome people! You have my dream job. Traveling around photographing stylish men and women... It must be wonderful. Very Handsome man! His women can be proud. I have been wanting a cycling cape for ages, I sewed on the collar last night. This photo inspires me again, I hope to hem mine tonight and wear it on my bike tomorrow. Mine has reflective fibers woven into the tweed - I hope it will drape as well as hers does. loooooooooooooove the gentleman. his posture, his outfit, his bike, all of it. Isn't he afraid that his pants leg will get caught up in the bike chain? Isn't that why bike messengers wear shorts, even in cold weather? He looks great, and I hope that his suit stays free of grease. I bicycle must be the ultimate accessory. Just take a look at Les Mistons by Truffaut (http://www.youtube.com/watch?v=NGb_r1ThNAs) when the short film opens with Bernadette Lafont riding a bicycle. Beautiful! ..she reminds me of Meryl Streep, like her style so much. Where do I get that guy's shoes? Such lovely pictures, love both the gentleman & the lady...elegant yet practical. I am a big fan of your bike shots!! and these two persons look so classy. BEAUTIFUL photos. The lady is wonderful :) She reminds me of Meryl Streep, which is never a bad thing. She reminds me of Cate Blanchett, shes so beautiful. The man is fantastic,I love his suede shoes, you couldn't get away with such attire here in rainy London! I love the bike culture. So effortlessly stylish. Just love the look of confidence with these people. Very at home with their bikes. These shots are so inspiring... I have a thing for bikes... even if I refuse to ride one myself for extreme (and absurd) fear of falling... but I always find myself staring at those who do ride them... It's almost entrancing. There is something about bikes that is just so chic. She's wonderfully natural. I always long for more natural women on here, Sart, and she encompasses what I've been wanting...comfortable, effortless, gentle, graceful, feminine, and sophisticated. LOVE her! Some awesome pics, love them! Keep up the great work! I like the woman in the cape/swing coat type of thing......it's a very flattering look. Isn't it funny that bicycle shots get such positive feedback on style blogs? I bike everywhere, but for my friends and I, it isn't about looking good: it's about travelling the most fun and greenest way! Looking good is admittedly a welcome side effect...however, I do wonder how many of the people who gush over bicycles being the "ultimate accessory" really see the advantages of riding one? To the person who wishes bikes were more popular in Madrid: you should start that trend! Also, just out of curiosity, how does one wear beautiful clothes to bike around without feeling sweaty and uncomfortable?? I want to look like that when I grow up! =) your pictures always make me smile. I like your pfotos.Good luck for the future.Cheers. The pictures sorta remind me of an episode from an English movie. BTW, I hate the American Apparel add - they are poorly contrast to the sartorialist pictures you posted. Who knew that 'green' could be so well tailored? personally, i dont really fancy the lady's scarf, its a bit too furry to be around the neck? i nearly mistook it for a stuffed animal, sorry. Bikes rule! They're ultra efficient and eco-friendly! Cars are boring and seldom beautiful. When you ride a bike you can look proud, classy and suave. Try doing that in a car. She makes me want to jump on my bike and ride away into never never land. The cape is just great ! Will put this on my 'must have' list !! Love the photos! She looks fantastic and him, he is just those kinda- sweet-kinda-wise looking man..:The fact that they both go by bike shows how selfconfident they are...I love their attitude, absolutely...No wonders, we all should use them more...its just a matter of trainning and having showers at the office! Fantastic. Wonderful image. A great lesson in style and citizenry. Madame is splendid. Can you imagine how cool that cape looks flowing along when she is in motion??? Fantastic! 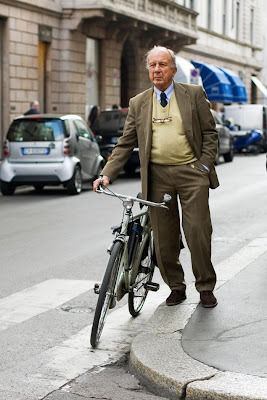 According few pictures I saw in this blog, senior men in Milan are quite good with dressing up, they know exactly how present themselves. TJ: If you look closely at his bike you'll see that there is a chain case, which affords even more protection than a chainguard in covering the chain and protecting his trousers. I have never seen a bike messenger using a chainguard. Lovely woman. This is so European, rare to see in America. Her healthy glow comes from bike riding. But she might also enjoy smoking and have a vodka on the rocks when she gets home. She buys organic vegetables at the farmer's market and also eats dark chocolate. Ok, what the hell do I know? In any case, her blonde hair and brown woolen outerwear are tonally perfect. Eclectic, elegant Paris! The woman is perfect, and she knows herself. The scarf is great and prevents the look from being too pedestrian. Pun not intended. how refreshing to see stylish people without that ultimate American accessory: the automobile! i especially like his shoes with that suit. gives it just the right touch of casual for the bike. so elegant! also not a huge fan of the scarf (fur-aphobe), but each to their own, and what a great bike! "Also, just out of curiosity, how does one wear beautiful clothes to bike around without feeling sweaty and uncomfortable?? Well, Anonymous 11.53pm, first you buy a step-through upright European-style bike with a chain guard and rubber pedals. Then you can wear skirts, dresses, flares and nice shoes. You ride to enjoy the trip, not to get there fast. You wear light clothes when it's warm, deodorant and perfume. I haven't worked out longer pencil skirts yet but I'll get there. Sorry, Mr Sartorialist, this is off-topic, but I want more riders like me out there and fewer warrior-courier types! These shots remind me of seeing people on bicycles last winter in Bologna. People who were dressed beautifully and appropriately for the weather (a mink cape on one 60ish woman!). It made me realize that a bicycle can be a practical form of transportation in certain cities and you don't need to don spandex to do it. I predict we will see more of this in the US when and if the popular bike-lending programs from Europe take off over here. does anybody know what kind of bike he has? it looks like a Urago but i can't be sure.....great picture. I also love your "bike culture" shots that show people living their lives, efficiently and clean, on bicycles. the perfect vehicle for cities. is that a watch fob chain hanging from the belt going to his pocket? with a charm of some kind? I envy the simplicity-- my 92 yr old very dapper Southern gentleman grandfather has excellent suits he's worn now for 40 years. He looks like a rather old Dustin Hoffman.